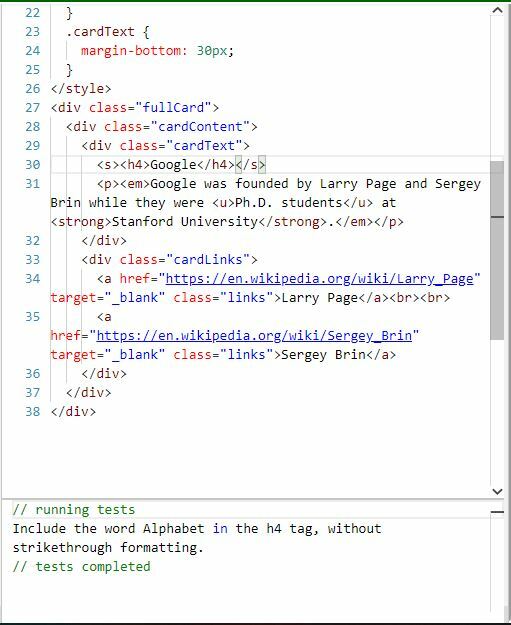 HTML tags should only be in the HTML portion of your code. I don’t understand. Sorry, I’m struggling with this one, and my learning disability has kicked in. The <style> section of your code, can only include CSS. CSS defines styles which are applied to HTML elements. The actual presentation of the web page is created with HTML. So, how exactly would I complete this one? It’s confusing me badly, and it’s hard to understand. It sounds like maybe you’ve inadvertantly done challenges out of order, or perhaps you’ve just been rushing through the lessons very quickly. I would suggest reviewing the basics of HTML and how tags work. I have not rushed through them. I’ve been going back through them already and taking notes on them so I can remember how to code one day in the near future, as I’m taking courses for Technology in college online right now. Ok. Well, what you need to do for this lesson is add an HTML tag containing the appropriate text. It says to wrap the s tag around “Google” inside the h4 tag. You wrapped the s tag around the contents of the h4 ruleset in the CSS section of your code. I agree with ArielLeslie, you should be able to do this lesson if you have completed the challenges in order. So, what you’re both saying is that in the HTML section of the code is where I need to wrap the s tag around? What about this code now? What am I doing wrong to get this? Look at the way you added emphasis to text in the paragraph under that h4 tag. Reread the task for this lesson. “Wrap the s tag around “Google” inside the h4 tag and then add the word Alphabet beside it, which should not have the strikethrough formatting.” Look closely and you can see it says to add the s tag INSIDE the h4 tag.